Barista Pro 3 Groups is the solution that adapts to all the needs of the espresso market. For Medium –high coffee consumption. It has 3 coffee outputs, 2 steam productions, and one hot water production. It is manufactured from 100% stainless steel and features a minimalist and functional design. It offers excellent quality in coffee, and the highest standards of food safety, as it meets energy efficiency standards. With ergonomic handles and illuminated buttons. Each group weighs 3,7 kg. In-factory setting, but programmable through the button pad. During distribution, the ground coffee is pre-washed for a few seconds with unpressurised hot water. Afterwards, it is extracted with pressurised hot water from the pump. This allows greater extraction of water-soluble substances and achieves a denser and longer-lasting froth. Neither stainless steel nor its soldering releases oxides. Its offers optimal corrosion resistance. It is an excellent choice from a hygiene point of view. Its design allows the entire top surface area (45 wide by 65 long) to be used as a cup warmer. Works in active or "ready-to-use" mode, with an energy-saving function. The rail around this top area is made of 100% stainless steel. Also, it features a double showerhead for optimal extraction and drying of coffee doses. Barista PRO, gives the possibility to have an insulated boiler to minimize thermal losses, but also be constructed from 100% stainless steel, even in the casing. Furthermore, it may have work area light and inox legs. Finally, it can be manufactured with a raised group to accommodate larger cups. On "Raised"models the distance between the coffee dispenser and the cup is 12 cm instead of 8,5 cm. Boiler INOX AISI 304, it is safe, it does not rust, and provides thermal stability, with welds of aerospace technology, without impurities, and resistance of stainless steel. With heat insulation capability. Steam / Water Wands of stainless steel. Multidirectional to 360º. 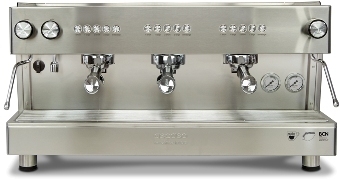 The steam wand is anti-lime scale and remains cool to the touch, reducing the risk of contact burns. Milk build-up is reduced to a minimum, making for easy cleaning.